An easy way to protect waterways from pollution and neighborhoods from flooding is storm drain tagging. 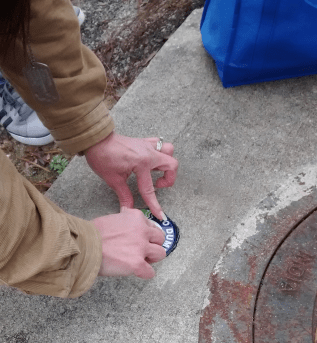 The Lexington Countywide Stormwater Consortium will supply volunteers with equipment needed to put tags on storm drains it in their own or other Lexington County and town neighborhoods. These markers are attractive and alert residents to refrain from dumping anything down a storm drain because it drains directly to the nearest stream. Anything other than rain water should never go down a storm drain. Also, storm drains are blocked up with yard waste, debris and vegetation, flooding can result after a rain storm. The Shirway Court Neighborhood Watch group (pictured above) decided they wanted to take care of tagging their storm drains. On November 8th, 2017 Officer Stacey Gadson and his Neighborhood Watch Group walked the neighborhood with caulk guns loaded with adhesive and storm drain tags bearing the “No Dumping, Drains to Waterway” message and proceeded to tag every storm drain on their street in an hour. During the process of tagging the storm drains, a couple of blocked up storm drains were noted. The County Public Works office was notified of this and shortly thereafter all the storm drains on Shirway Court were cleaned of debris and vegetation that was hiding the storm drain.